The Houston Bike Plan was adopted by City Council and Mayor Sylvester Turner on March 22, 2017. The City is in the process of identifying the next steps to prioritize and implement recommendations of the Plan. 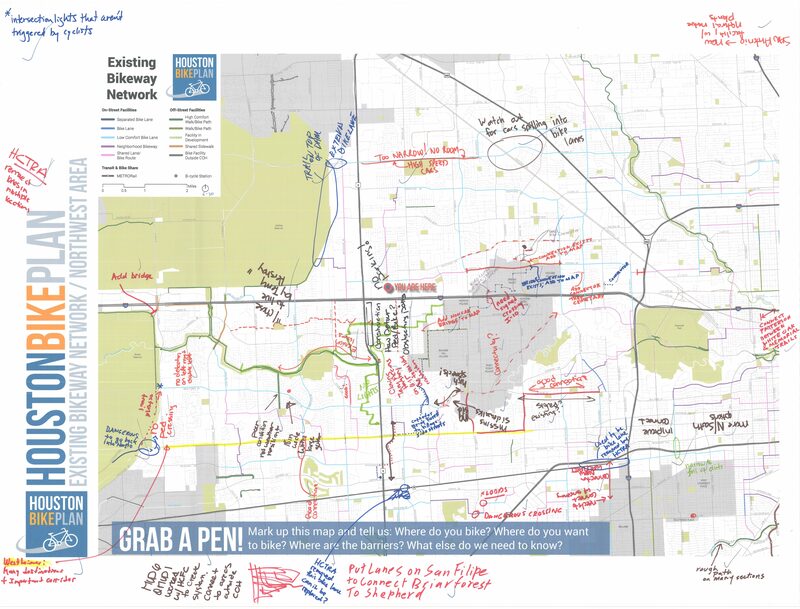 The Houston Bike Plan documents, maps, and spatial data are available to view and download below. 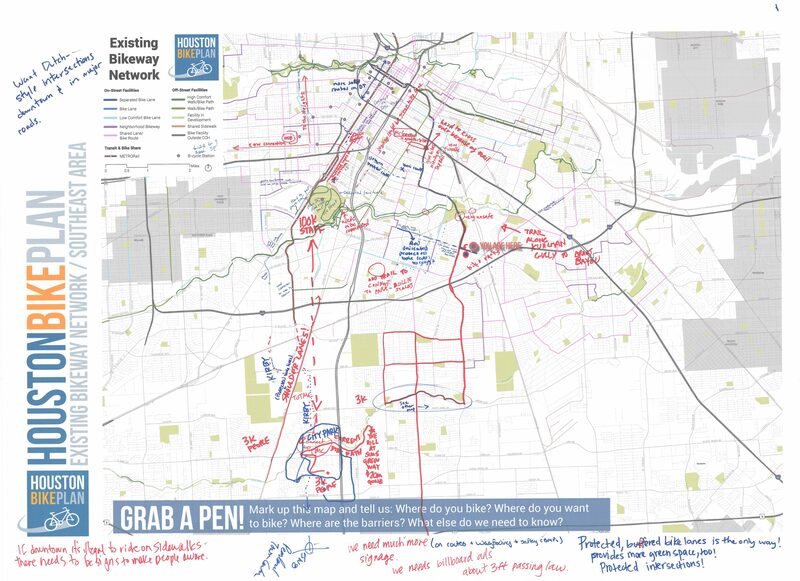 As the Bike Plan was developed, Houstonians across the city were engaged in a variety of ways to share their knowledge of the city’s streets, infrastructure, and opportunities to make bicycling better. 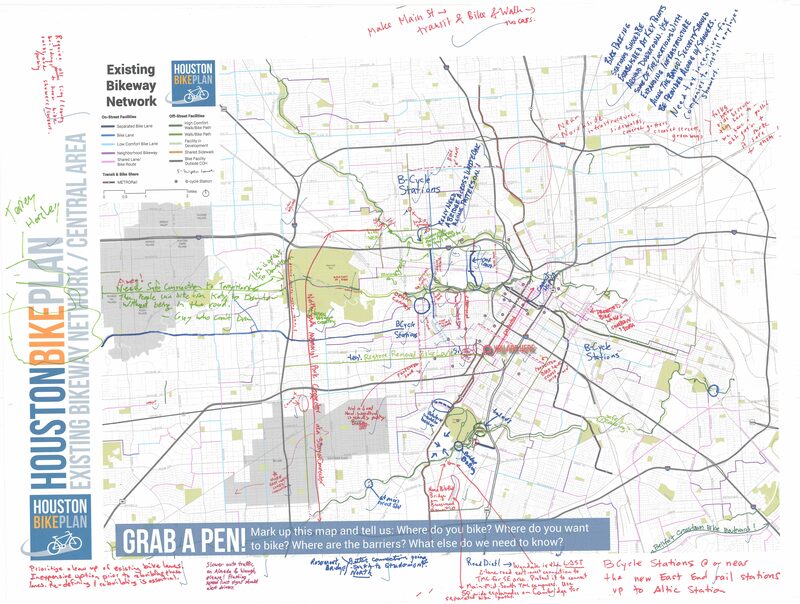 In 2015, we received public comments on the streets people felt were appropriate for new or improved bike facilities, barriers to bicycling, opportunities for more people to bike, and policies and programs to support increasing bicycling. 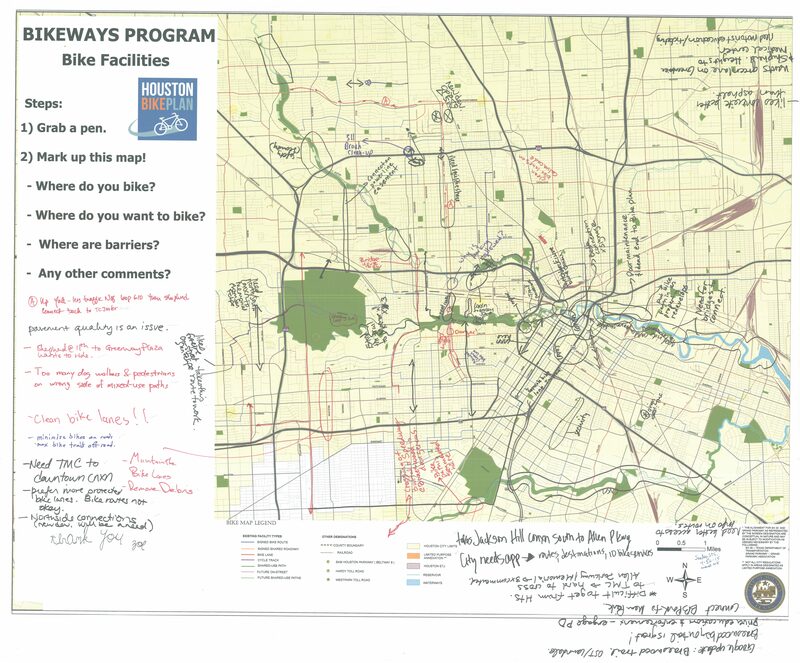 Displayed below are several examples of maps where Houstonians told us about where they bike and where they want to bike. In 2015, we received over 950 comments in writing, by phone calls, by email, in person, and on maps like these below. 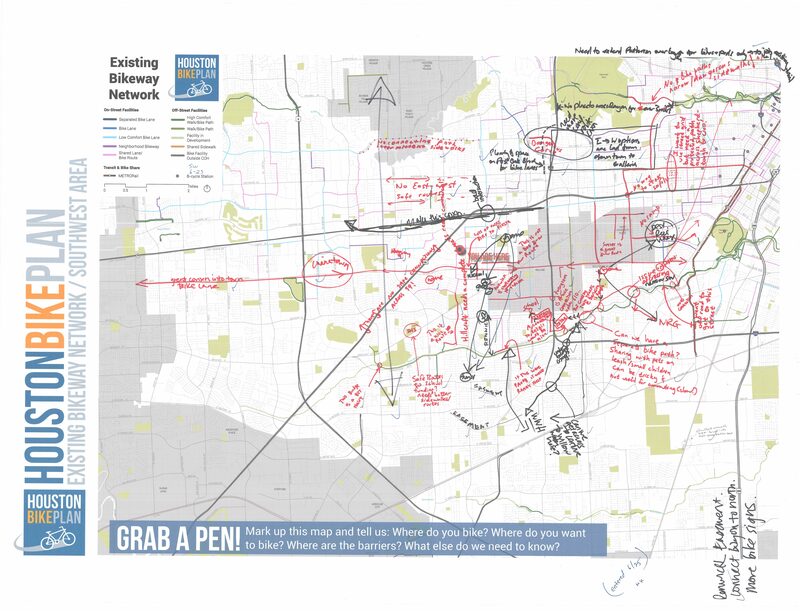 The development of the Houston Bike Plan was supported by members of the Bicycle Advisory Committee (BAC). The BAC was made up of community leaders, appointed by the Mayor, representing a diverse cross section of Houston and the bicycle riding community. The BAC included members of partner agencies and potential future partners for implementation of some of the recommendations that will come out of the project. 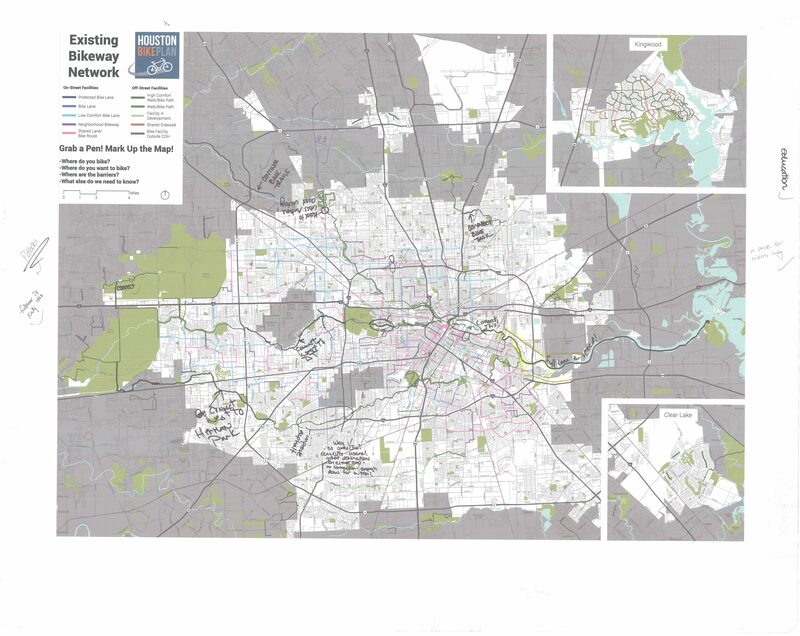 Roles of the BAC included serving as a sounding board and guiding the direction of the plan, reviewing and providing feedback on plan goals and recommendations, and helping promote participation in the plan development across the Houston community.